Anthropogenie oder Entwickelungsgeschichte des Menschen. Leipzig: Verlag von Wilhelm Engelmann, 1874. Ernst Haeckel was an early German convert to Darwin’s theory of evolution by natural selection, and he was quick to realize that the evolutionary tree must include humans. 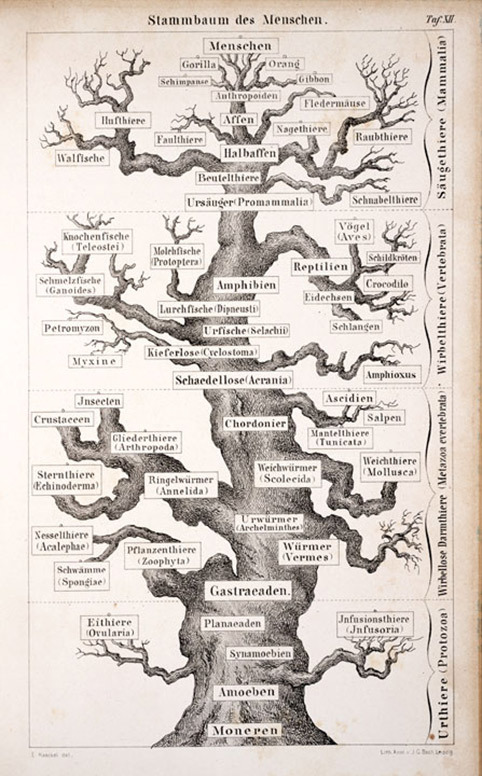 In this book on human origins, Haeckel presents the first graphical depiction of a “tree of life.” The part of the tree of interest here is the very top, where “Menschen” (humans) share a branch with chimpanzees, gorillas, orangutans, and gibbons. The root of that branch is labeled “Anthropoiden”. It is evident that Haeckel believed that humans and apes derived from a common “Anthropoid” stock. Elsewhere he proposed a name for that missing link: Pithecanthropus. Haeckel suggested that Pithecanthropus was out there somewhere, waiting to be discovered. Some of his readers would take heed.